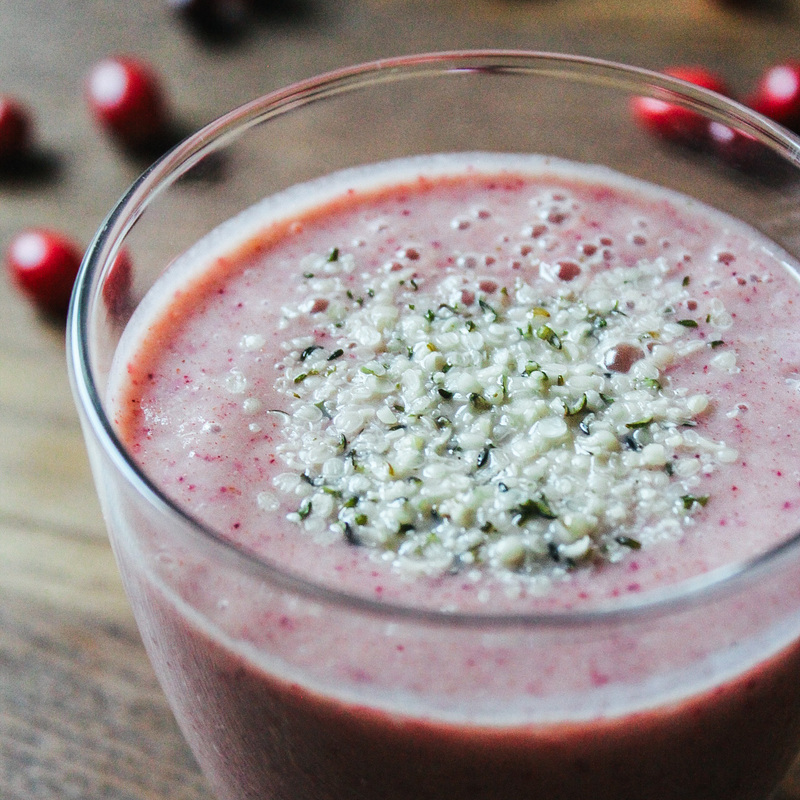 Give your body a tall glass of tender love when you sip a pink Cranberry Smoothie with Ginger, Flax, and Hemp. 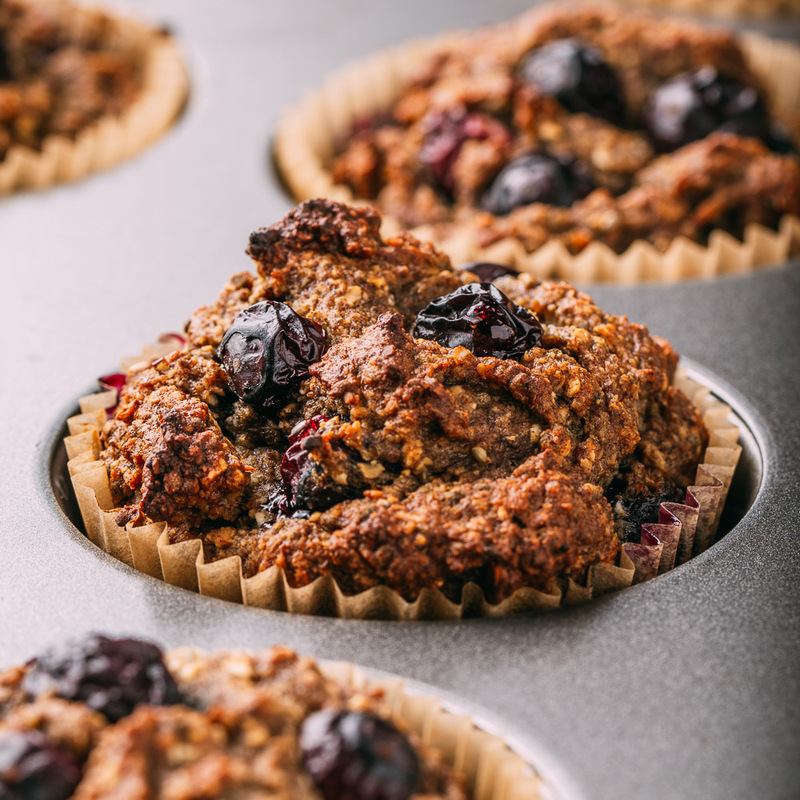 Just toss the nutritious ingredients into the blender and treat yourself to pure goodness! As a result of the one-step prep being kind to yourself has never been easier. 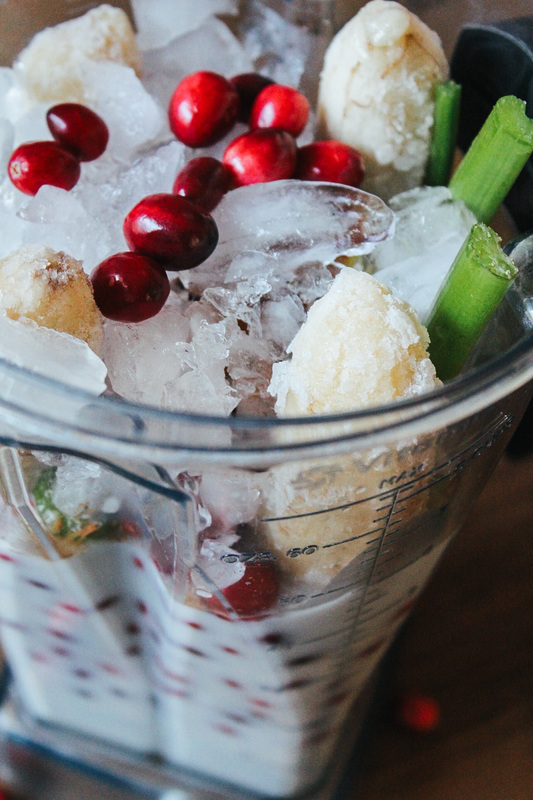 Making a homemade Cranberry Smoothie is easy-peasy. There’s nothing more satisfying than a refreshingly tart Cranberry Smoothie. Perhaps the best way to describe this pretty in pink, extremely nutritious, smoothie would be to say that it’s just a teensy bit sweet and a weensy bit sour. But there’s SO much more to the cranberry than just its bright red good looks and ying-yang taste. 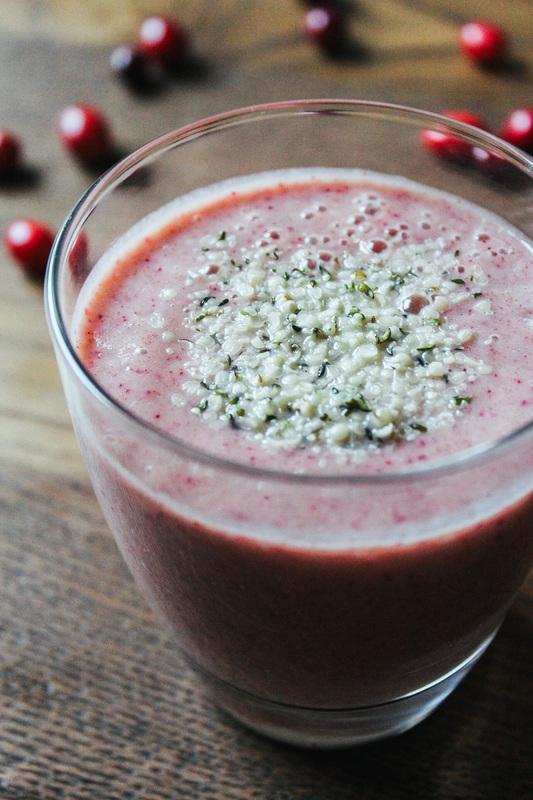 Above all else, this Cranberry Smoothie is incredibly good for you! As a result of its lengthy list of nutrients, the cranberry is said to assist in the prevention of certain types of cancer and improvement of immune function. Lowered blood pressure is another health benefit of eating delicious cranberries. Additionally, while being super high in nutrients, cranberries are also low in calories! Win-win! Ginger has its benefits, too. Ginger helps regulate sugar levels, treats nausea, boosts bone health, relieves joint pain and reduces menstrual cramps and may enhance sexual activity. Yowsah! Also, flax is a plant source of omega-3, and most Americans are short on their omega-3 fatty acids. Essential fatty acids play a significant role in the anti-inflammatory system of our body and, in case you haven’t heard, inflammation is at the root of most disease. Additionally, flax contains lignans which reduce the risk of breast cancer in women and prostate cancer in men. Lignans serve to alter the way the body metabolizes estrogens into safer forms. There are way too many benefits of flax to list them all in this recipe post, but now you can see why it’s a good thing to keep flax within reach to sprinkle into smoothies and everything else you eat. So, when it’s that most wonderful time of the year when cranberries are in season, grab a few extra bags to store in your freezer. Since cranberries freeze well, it only makes sense to keep some extra on hand to enjoy throughout the year. This recipe makes enough smoothie to share with a friend, or you can easily save the second portion in the fridge to enjoy later. A nutritious smoothie that’s ready to savor when hunger hits can help avoid those fridge raids that leave us filled with regret. For more cranberry deliciousness, try our simple to prepare Raw Cranberry Fruit Salad Relish Sauce recipe as a delicious topping to keep in the fridge to enjoy in the place of jam. Cranberry Salad also tastes terrific and looks beautiful when it’s piled on top of our Vegan Gluten-Free Cornbread Muffins. Our pretty in pink, sweet-tart drink makes a perfect breakfast or energizing snack. 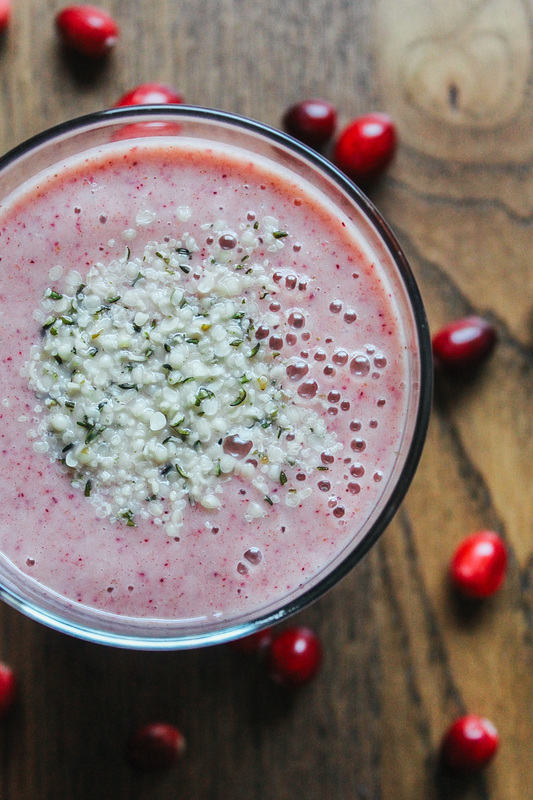 Because it’s brimming with protein, antioxidant-rich cranberries and the anti-inflammatory properties of ginger, our Cranberry Smoothie with Ginger, Flax, and Hemp is much more than a delicious treat; it’s a quick way to do your precious body a health-boosting favor! 1 cup cranberries, fresh or frozen - If cranberries are not available, use strawberries, or another berry! Place the ingredients in your blender in the order above. Set a few hemp seeds aside to use as a garnish if you like. If you happen to be using frozen bananas or cranberries to make your smoothie, include frozen ingredients as one of the last items along with the ice. Many blenders perform their best when frozen ingredients are incorporated after it has chugged through softer components. Blend on high for about a minute or so or until your smoothly looks irresistibly pink, smooth and creamy. 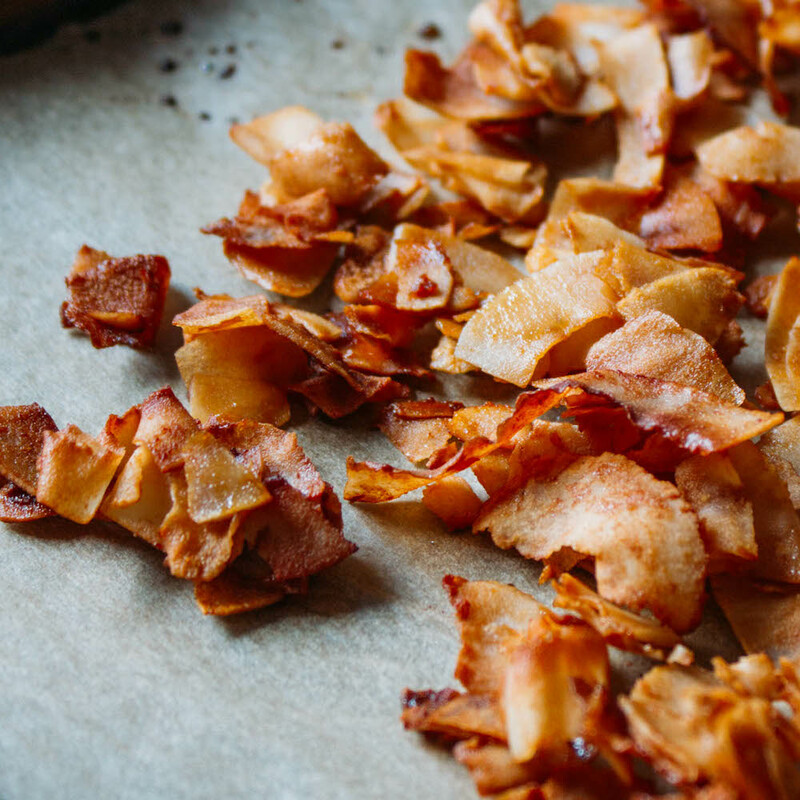 Ingredients with bold flavors such as cinnamon and ginger should be increased or lessened to suit your taste. When you're all out of cranberries, use strawberries, raspberries, blueberries, or another berry. While I have not tried this recipe with mango, I'm quite confident it would taste terrific! 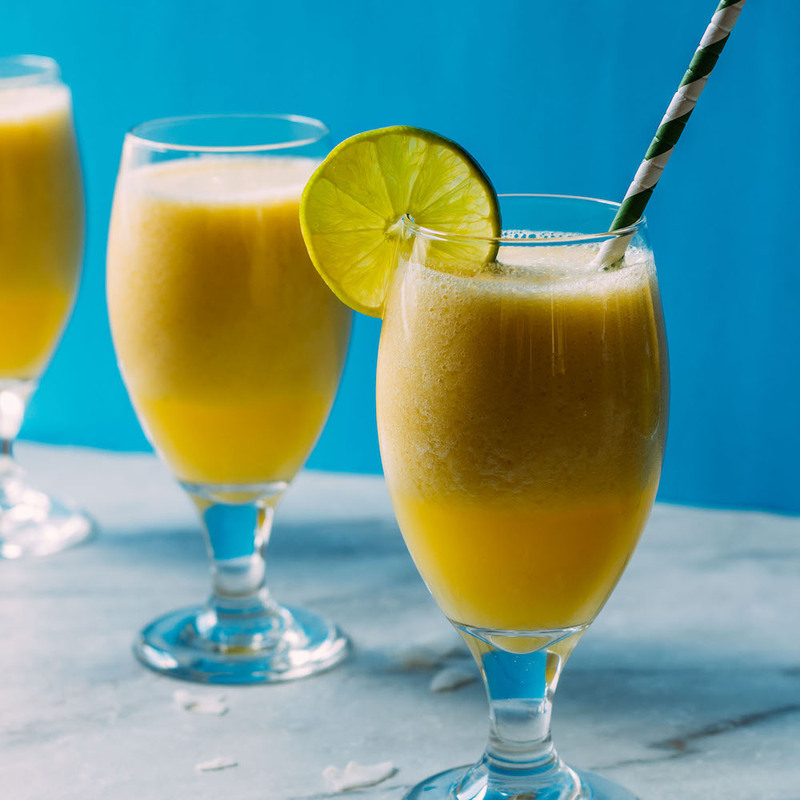 When using frozen ingredients in smoothie recipes the thickness increases and the smoothie's temperature is much colder. High powered blenders such as the remarkable Vitamix, quickly chomps through frozen parts with extreme efficiency and produces an outcome that is as lip-smacking-smooth as homemade ice cream. Frozen cranberries will also work just the same as fresh cranberries in our family favorite 1-Bowl Raw Cranberry Fruit Salad. When Mike and I drink our delicious smoothies, we use straws that are either made of reusable glass, stainless steel, bamboo, or environmentally friendly biodegradable paper. I love this smoothie! The second one I had I bumped up the nutrients with additional kale and turmeric. Yummy! Kale and turmeric are both so nutritious – terrific adds, Cheryl! Thanks for sharing a new way to make this recipe your own.